Parents Operated Control System - This specialized feature is designed for Swipe Junior enabling the parents to keep a check of the -contact list- their kids are connected to, control/limit the time spent on internet browsing, games or any other apps. Swipe Junior grants extreme flexibility to have SOS emergency dialing facility with just one click. 2.Equipped with powerful Geo-positioning: An amazing technology and first of its kind to control the Kid-s movement, limiting them to be within defined Geo-Fence area. Parents can monitor the phones location through GPS and can also set -safe- and -danger- zones for their child. 3.Customize UI for kids - Parents can customize the wallpapers that their kids find attractive and set ringtone that are soothing for their children. Kids can enjoy the preloaded apps that are fascinating for them and can also ignite their imagination with interactive story books. Shockproof & Durable design - Considering the fact that kids drop the devices, the device has a specially designed shock & break proof body made with food grade material. 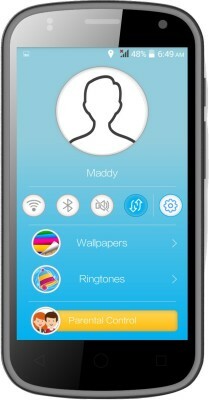 On Cloud - An all-time real cloud connectivity makes Swipe Junior world-s only unique cloud connected mobile for kids.